I don’t want the involvement of any effort on my part. bring the luminescence to me. swinging paddles through the Puerto Rican deep. watch the little creatures crackle to light. a long way from the Mesozoic. soldering speck-sized lights into their dino DNA. The dinosaurs never died away. They didn’t evolve into rhinos or birds. crackle and roar to light. and in without a struggle. for more than a pacing. hair and the cows’ tails. and push the woman ahead. to come land on their hands. a sun burning the lake. made your scent my mate for life. making dents vents for your coconut scent. Put your arms around me the scent whispered. soured the beer I drowned every night. I don’t blame you for being gone before morning. René Ostberg is a native Chicagoan who still resides in Illinois. She writes a blog with a travel theme called ‘Writing and Wayfaring’. 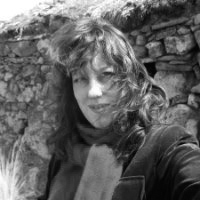 Her writing and photography have been featured at Drunk Monkeys, Literary Orphans, Booma: The Bookmapping Project, Eunoia Review, Wilderness House Literary Review, We Said Go Travel, Rockwell’s Camera Phone, and the Encyclopaedia Britannica blog, among other places. You can read more of her work at reneostberg.wordpress.com.